Sting jets are wind maxima near the end of bent-back fronts in cases of strong cyclones. As noted earlier on this blog, they can acquire a characteristic look in water vapor imagery, vaguely reminiscent of a scorpion’s stinger. In addition, strongly sinking air around the jet, usually associated with both a tropopause fold and a maximum in ozone, is manifest as a warm (dry) patch in the water vapor (WV) imagery. In the animation above, the sting jet is apparent moving across northern Denmark into southern Sweden between 1500 and 1800 UTC. This is in association with the ‘St. Jude’ storm that killed more than a dozen across northern Europe (Reuters news story). The strong sinking near a sting jet can transport momentum down to the surface. You should therefore expect to see strong surface wind gusts near the water vapor satellite signature, and that was the case on October 28, as shown below. Suomi/NPP viewed this storm early in the day on 28 October. The toggle between the VIIRS Day/Night Band and the 11.45 µm IR data, below, shows a developing baroclinic leaf over the British Isles. A comparison of Aqua MODIS 0.65 µm visible, 11.0 µm IR, and 6.7 µm water vapor channel images visualized using the SSEC Web map Server (below; courtesy of Russ Dengel and Kathy Strabala, SSEC) showed the storm at 12:14 UTC on 28 October. The warm/dry signature of strongly-subsiding middle to lower tropospheric air was particularly evident on the water vapor image (yellow to orange color enhancement) as it was beginning to move eastward over Denmark. For additional satellite images of this event, see the EUMETSAT Image Library and the Wide World of SPoRT. As a large upper-level trough was deepening and moving inland across the western US on 28 October 2013, strong winds interacting with the rugged terrain of the Southwest produced widespread areas of mountain waves, as revealed on McIDAS images of 4-km resolution GOES-13 6.5 Âµm water vapor data (above; click image to play animation). The fast speed of the animation revealed the non-stationary, “fluid motion” of some of the mountain wave features (especially over northeastern Arizona) — perhaps a clue that they might be associated with turbulence that was of moderate or greater intensity. In general, mountain waves that are quasi-stationary (and non-interfering) do not seem to produce more than light turbulence. AWIPS images of composites of GOES-15 (GOES-West) and GOES-13 (GOES-East) 6.5 Âµm water vapor channel data with pilot reports of turbulence (below; click image to play animation) showed numerous reports of moderate to severe turbulence at a wide range of altitudes. In fact, there was even a relatively rare occurrence of a pilot report of Extreme turbulence at 18:01 UTC over far northwestern Arizona (at an altitude of 41,000 feet). Not far to the north, there was also a report of Severe turbulence at 23,000 feet over southwestern Utah. An AWIPS comparison of 1-km resolution MODIS 0.65 Âµm visible channel and 6.7 Âµm water vapor channel images at 20:19 UTC (above) showed that while some of the mountain wave features were at least partially marked by roll clouds on the visible image, many of the mountain waves were occurring in clear air. Just as we have documented in previous blog posts (on 25 April 2013, and 04 June 2009) using visible imagery during daylight hours, Suomi NPP VIIRS 0.7 Âµm Day/Night Band (DNB) imagery can also be used to help diagnose areas of light winds over water at night (using reflected moonlight). The VIIRS DNB image at 08:20 UTC or 3:20 AM local time on 25 October 2013 (above) showed a broad area of bright moon glint over the western Gulf of Mexico, off the coasts of Texas and Louisiana. However, located within this area of bright moon glint was a very dark band, oriented roughtly west-to-east. An overlay of the 06 UTC GFS40 surface winds suggested that there should be a band of calm winds in this area, ahead of a slow-moving cold frontal boundary that was sagging southward across the Gulf Coast region. Surface observations and buoy reports confirmed that the winds within and near this dark DNB feature were either calm or very light. As a result, wind-driven wave heights there were minimal, allowing for an effectively “flat” water surface. So, why did this large area of â€œsmooth waterâ€ appear darker on the VIIRS DNB imagery? The answer lies in the fact that with imagery from polar-orbiting satellites such as Suomi NPP, there is often a significant amount of sun glint or moon glint off the rough water surfaces below the satellite overpass; due to the varying scattering angles of the light reflected off of wind-driven waves, these areas of rough water surfaces appear brighter on DNB imagery. However, in an area of calm winds, the water surface becomes very flat; this flat water surface then reflects incoming moonlight like a mirror (with all the light being reflected back in one direction â€” but in this case, that one direction was not directly back toward the satellite). One other feature of interest on the DNB image was the very bright “streak” located well south of the Mississippi River delta. A comparison of the DNB image with the corresponding VIIRS 3.74 Âµm shortwave IR image (below) indicated that a “hot spot”Â (yellow to red color enhancement) was co-located with the bright DNB feature — this suggests that a large natural gas flare was occurring at one of the drilling platforms at that particular time. Numerous smaller bright spots could be seen scattered across the Gulf of Mexico on the DNB image, signatures of lights from ships and other offshore drilling platforms. On the shortwave IR image, there were also hot spots seen in Texas and Louisiana, which could have been due to small fires. McIDAS-V “before” (22 October 2013) and “after” (23 October 2013) night-time images of Suomi NPP VIIRS 0.7 Âµm Day/Night Band data (above; courtesy of William Straka, CIMSS) showed the coverage of power outages across much of Syria, caused by a rebel attack on a gas pipeline (near Damascus International Airport) that supplied the Tashrin power generating station in the southern part of the country. 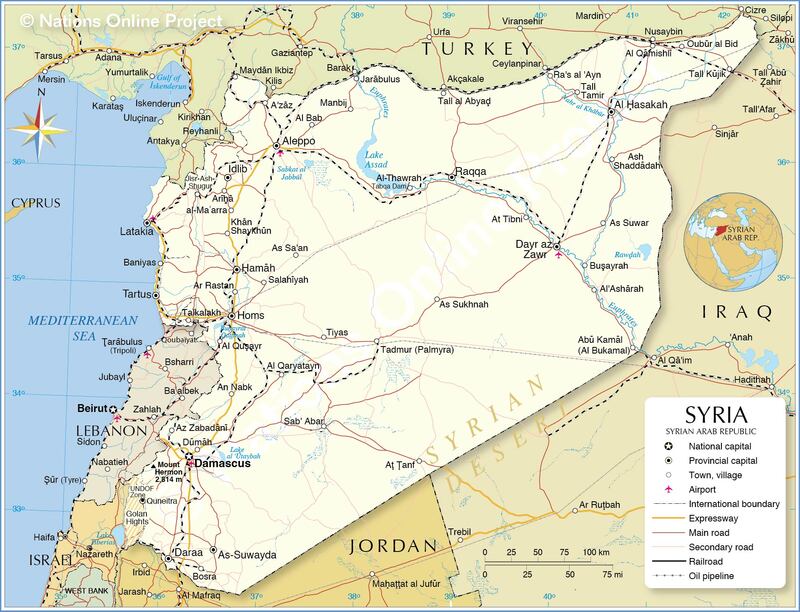 As can be seen in the “after” image on 23 October, full or partial power outages affected all provinces of Syria — in particular, parts of the Euphrates River valley, the northern Mediterranean coast near Latakia, and areas south of the capitol city of Damascus (map of Syria).